UCF has held multiple on-campus Go Baby Go workshops in the past two years to help children in the community. Jennifer Tucker spent much of her time at last week’s National Down Syndrome Congress Annual Convention in Orlando showcasing and leading efforts to enhance mobility in children with disabilities. But the physical therapy lecturer took a break Saturday night to accept a President’s Award from the NDSC for her work on UCF Go Baby Go!, a mobility initiative she founded last year in the College of Health and Public Affairs. For more than a year Tucker has partnered with Professor Cole Galloway, the nationally recognized founder of Go Baby Go! at the University of Delaware, to establish a Go Baby Go! program at UCF. She’s worked tirelessly with UCF colleagues to hold Go Baby Go! 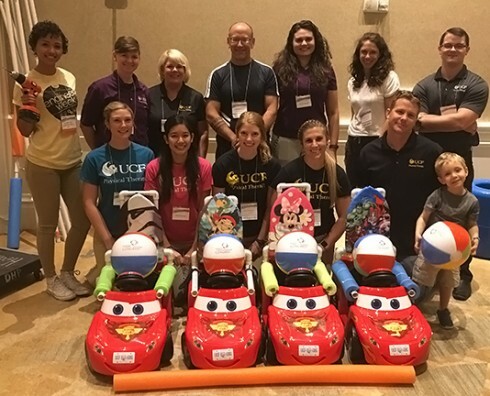 workshops where physical therapy students and staff members join families and community members to retrofit motorized toy cars for children in need of enhanced mobility. Earlier this year she helped launch Knights on the Go Café at UCF as the first site in Florida to demonstrate the Go Baby Go! harness system for adults recovering from a traumatic brain injury. At the NDSC convention Tucker and Galloway presented a workshop on the influence of mobility in the development of infants and young children. They also demonstrated a Go Baby Go! motorized toy car and the harness system. The next day Tucker led a team of physical therapy students and an engineering student from UCF as they conducted a workshop for siblings of children with Down syndrome. Both Tucker and Pabian said there was a great deal of interest in Go Baby Go! among convention goers, which numbered in the thousands. They’ve also seen great interest among local community members. Tucker said she was honored and humbled to accept UCF Go Baby Go!’s President’s Award from the NDSC, which consists of the “families and children we serve.” She also said she’s thankful to the university, college and program’s leadership and administration for their continued support and encouragement. “Together we can continue to create opportunities for fun and mobility for children with mobility impairments,” she said.